Dr Peter Burt (Chiropractor) uses a range of chiropractic techniques in his practice and whether these are used alone or in combination depends on your personal needs, as all care is tailored to your requirements. As part of your care, you may also receive therapeutic massage, offered by our massage therapist, and nutritional advice is additionally available to all clients. However, before you receive a course of chiropractic therapy, diagnostic tools are used to take objective measurements, so that your progress can be accurately assessed. Diagnostic testing is offered routinely as part of our service for all clients. While the thought of these tests might make you nervous, there is no need, as they are suitable for both children and seniors alike. As testing is an interactive process, many patients actually find it an enjoyable experience. Click to read about our four main assessment tools used by Dr Peter. Whether suffering from joint problems, back or neck pain or headaches chiropractic techniques may prove effective. 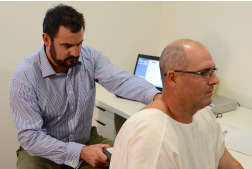 Although patients can worry about the suitability of these adjustments for them, which is particularly a concern among parents, athletes and seniors, the techniques used by Dr Peter are suitable for all ages and body types. This means that all members of the family can receive the chiropractic manipulations on offer here. ur digestion, immunity, concentration or sleep, modifying your diet can help. Dr Peter is able to offer suitable dietary advice based on your health needs, including the use of appropriate nutritional supplements. If supplements are recommended, these are at an additional cost, though all are natural. Make an appointment to discover how these techniques and services can benefit your health. If you have any questions about starting care, call us at Highlands Family Chiropractic today!